As luck would have it, and just three days before the race, on Saturday I started experiencing the typical telltale signs of a looming cold with a scratchy throat, headache, and body aches. On Sunday morning I felt worse and on Monday even worse. By Monday afternoon I gave in and started taking meds for head and chest colds and was amazed at how much better that made me fell. Tuesday morning (New Year’s Day) I awoke feeling good enough to join my friends at the race! Packet pickup was from 8:15 to 9:15 for the 9:30 AM race. I arrived at around 8:50 and easily parked near the brewery serving as the packet pickup location. Last year’s swag was a warm blanket that was handed to us at the finish line and this year’s swag was equally as unique. We had the option of picking up our hat, gloves, and buff at packet pickup or after we crossed the finish line. Once in the brewery, packet pickup was a snap, but I was disappointed that because I’d registered so late that I didn’t get a bib with the logo on it which would have matched my outfit so well! Instead, I got a generic yellow bib. Oh well, you snooze, you lose! It was 58° and overcast on race morning, a stark contrast to last year’s 12° and sunny. Once I found Erin and Kim inside the brewery, we hung out for a few minutes before heading back to our cars to put away our race swag. 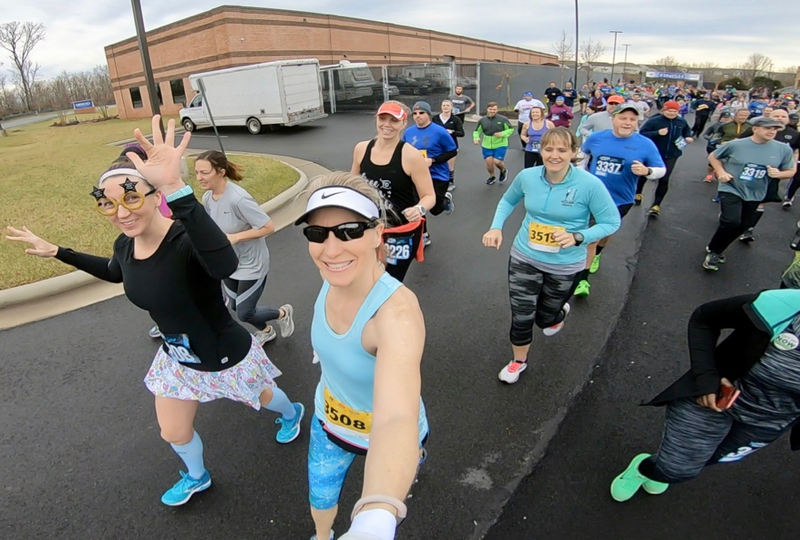 Once we’d found Angela and had all hit the porta potty (the line to the indoor restroom was very long), we turned just in time to see MRTT friends from a neighboring chapter. 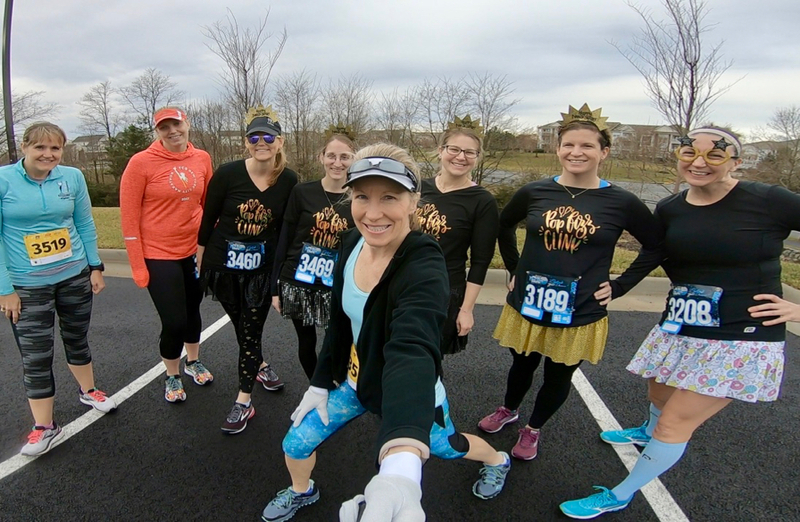 If these ladies look familiar, it’s because they were my van 1 teammates from Ragnar DC; and Gayle (3189) was my team captain at Ragnar Trail Appalachians WV. 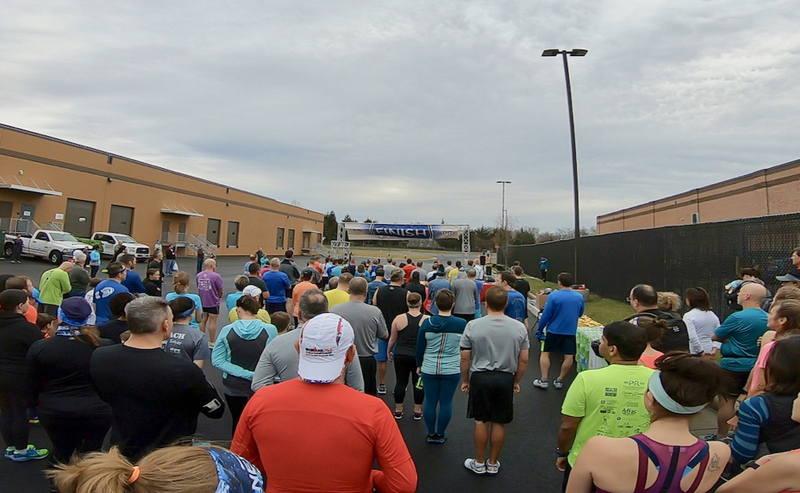 We made the short walk around to the back of the office park to where the looped course race would be starting and finishing. I dumped my throwaway jacket beside the fence with the hopes that it would be waiting for me after the race. I debated on whether or not my fingers would be warm enough without gloves and opted to keep my sparkly gloves on, something I later regretted. Check out the guy in the green shirt behind us. He’s yawning in this picture and in the following picture. Something tells me he stayed up late to cheer in the new year. Suddenly, the runners around me were running and we were off (obviously, I still couldn’t hear the announcer). 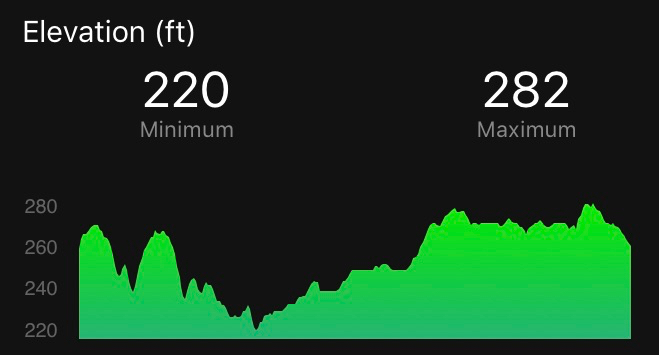 As I approached the starting mat I realized that I hadn’t turned on my Garmin, but fortunately, the GPS synced immediately and I was good to go. Just after heading out of the chute, I pulled out my GoPro for another pic. 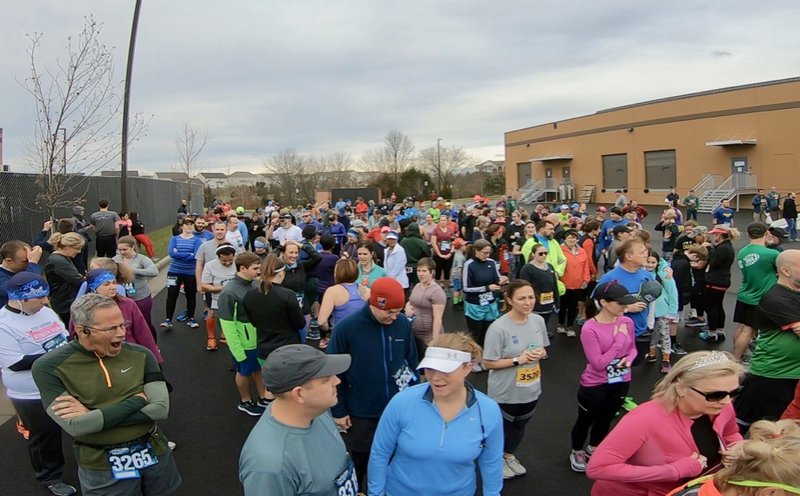 The race course ran through a less than scenic section of Ashburn – down a parkway, past some homes, past an over-priced carnival, through an office park, and back to the backside of the brewery; but it was relatively close to home so I’m not complaining. We ran very near One Loudoun, home of my beloved Trader Joe’s! My friends all agreed that we’d stay pretty close together even though I told them to run their own races and not hold back for me. They stuck to their word and even when I felt that sharp pain deep in my glutes within the first quarter mile and had to slow down, they slowed down with me. Just before we hit the one mile mark, our other MRTT friends who we’d seen earlier caught up with us, hung out long enough for a picture, and then continued on at their faster pace. Erin and I settled into conversation, loving the chance to catch up while chatting about our families and our jobs. 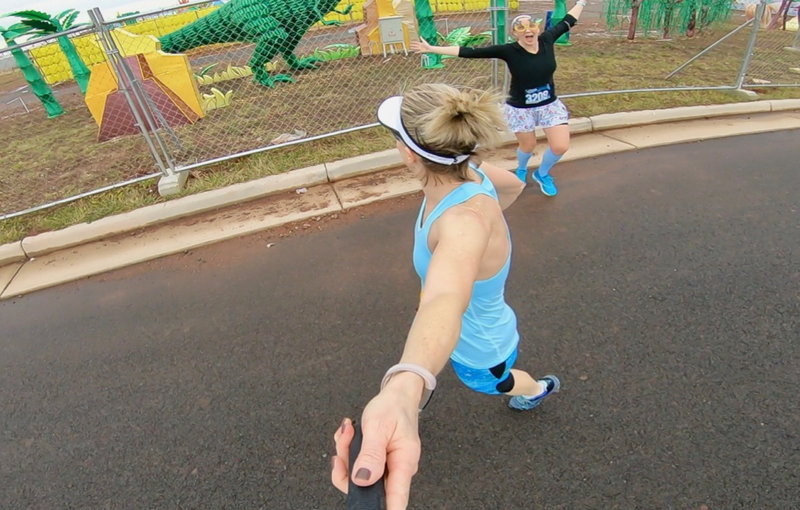 When we ran past the carnival, I turned my GoPro back on hoping to capture Erin and the T-Rex. Unfortunately, I had the camera angle turned down a bit too much and didn’t get a very good shot. With about a half mile to go, we heard little footsteps coming up behind us. 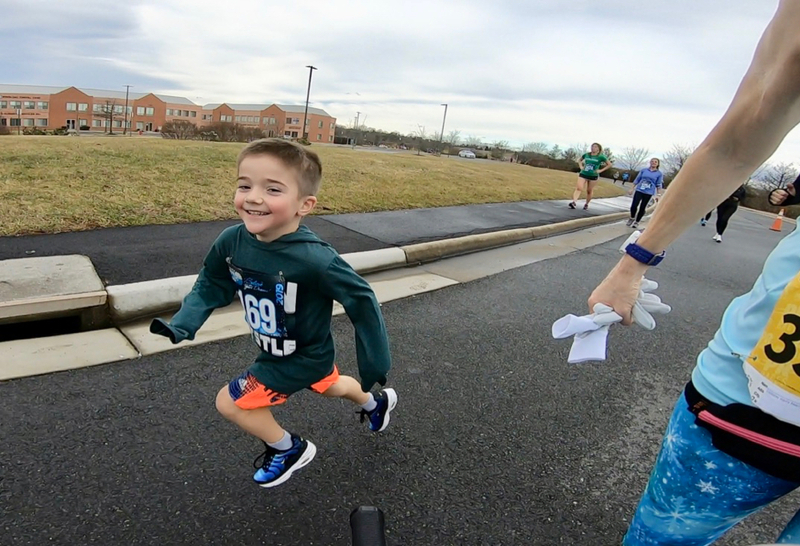 Tyler, who is five and a half, was running strong and with a huge smile on his face! 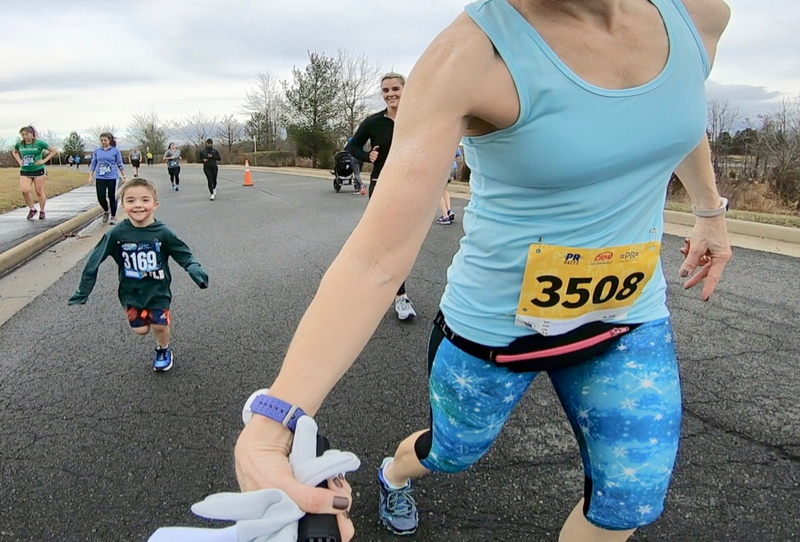 We learned from his mom that he was in front of his eight-year-old sister and that was all the incentive he needed to keep running. We watched as Tyler and his mom pulled ahead. I really wanted to try to keep up with him and see him cross the finish line, but knew it was best to stay at my current pace or I’d regret it later. I checked the results later and Tyler beat his older sister by 2:59! As we approached the final turn that would take us behind the brewery and to the finish line, I didn’t have the usual urge to pick up the pace and finish strong. Instead, I cruised across the finish line, happy to have the race behind me. My official time was 34:13 (11:02 pace) which put me in 3rd place out of 6 women in my age group. According to my Garmin, I didn’t run my tangents very well and ran 3.25 miles for a 10:31 average pace. Kim and Angela had pulled ahead and finished about a minute in front of us, but it was no problem finding them after we finished the race. It was also no problem finding my throwaway hoodie right where I’d left it. Even though I was perfectly comfortable running in a tank, I was happy to have my jacket back on once I stopped. While the four of us were wandering around the sea of runners, I saw my longtime Cruiser friend Terri. 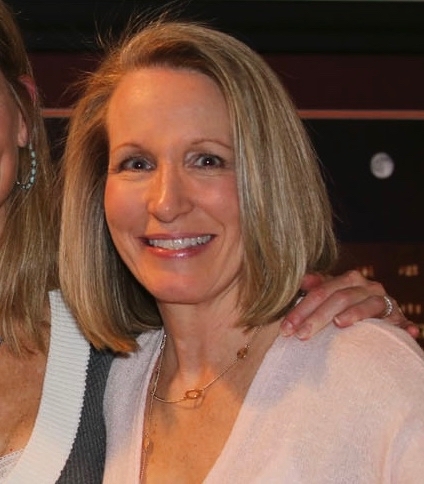 Back in the day, she and I ran most of our long runs together and traveled to Atlanta for the 2008 Georgia Marathon and to Scranton for the 2010 Steamtown Marathon. 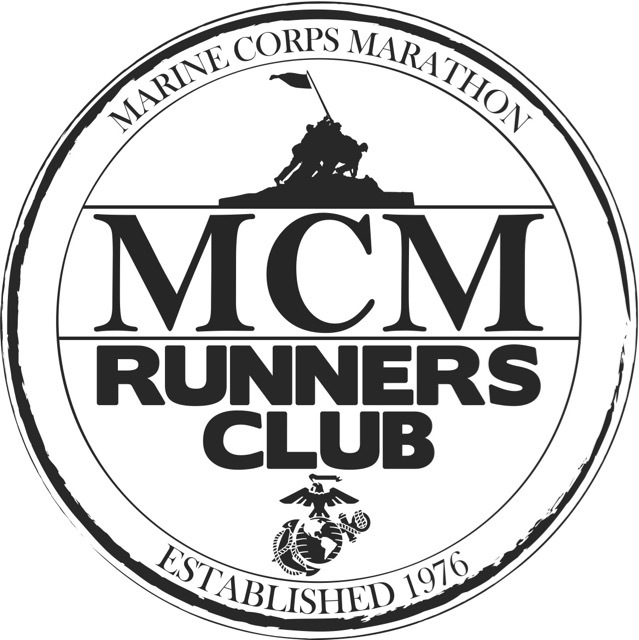 Additionally, we ran several Marine Corps Marathons and local shorter races together. We decided to skip the post-race snacks of bananas, bagels, etc. and opted instead to spend an hour together chatting over coffee. After a quick stop in at the brewery to check our times posted on the window, we drove over to the nearest Starbucks for coffee (hot chocolate for me). It was so nice to spend time with these ladies who mean so much to me and it was the perfect way to start my new year! 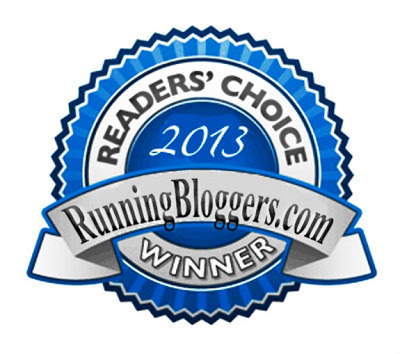 I’ve run several races directed by Lesley, and her races are always fun, well-organized, and very affordable. 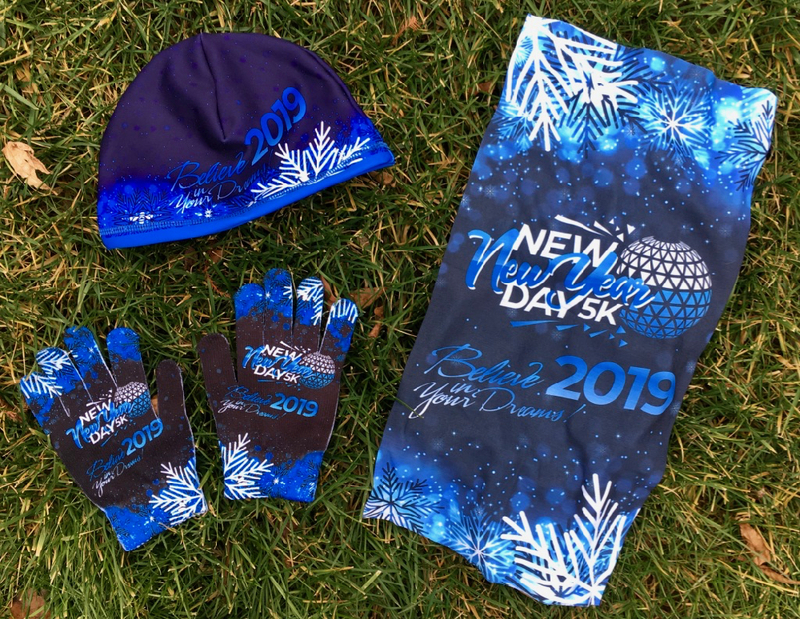 The swag in her New Day New Year 5K is a welcome treat for this runner with a closet full of race shirts. I suspect I’ll be back next year to ring in 2020! 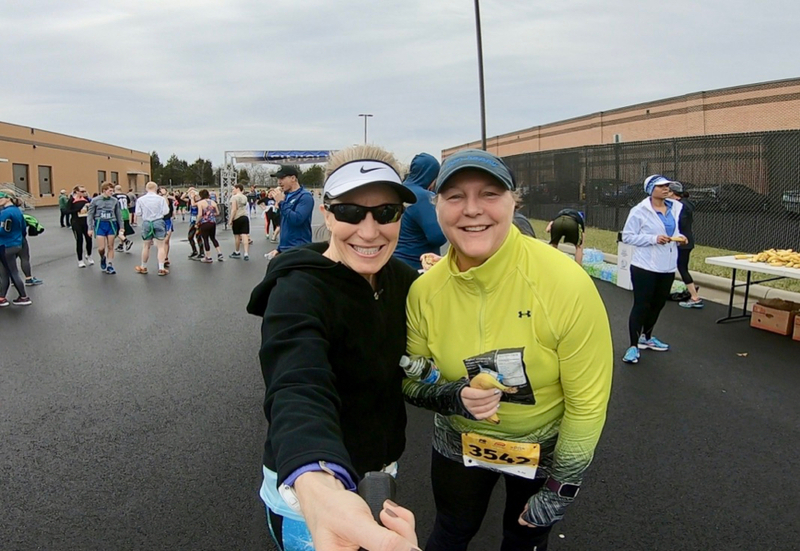 Did you run a New Year’s Eve or New Year’s Day race? What big plans do you have for 2019? It turned out to be oddly warm that day! I like the idea of the gloves and hat instead of a shirt. Glad you were feeling better to the race. Yes, the hat, gloves, and buff were such a welcome change! Aww…you have such a nice group of running friends. It was great seeing the pictures of you all together. I think you and I could run together now that we are both injured. My pace lately sounds about like yours. 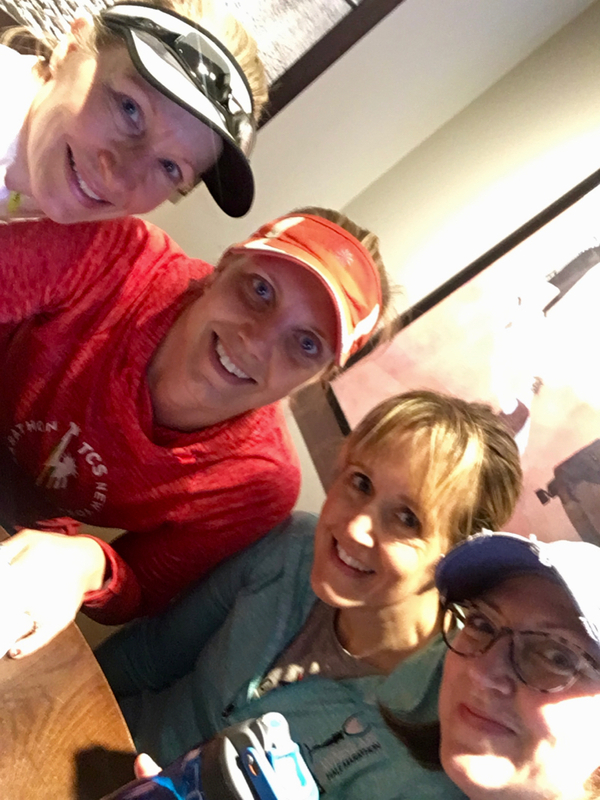 Yes, my running friends are the best! I suspect you and I would be good running partners with similar paces both when we’re healthy, and now that we’re injured. Congrats on the race! Hope your glutes feel better soon. 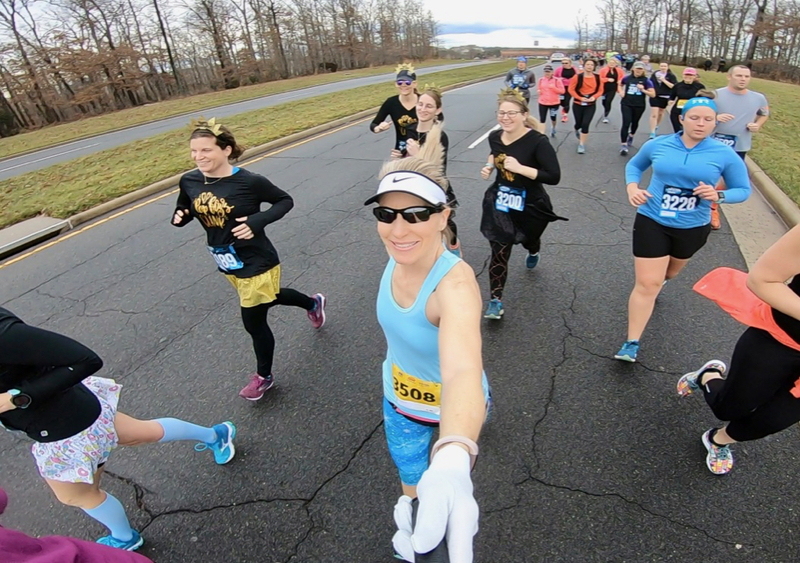 I did run a almost 4 mile “race” (support run, really), on NYD — I usually do, except last year, when it was cancelled due to the cold. This year was much warmer but still not tank weather.